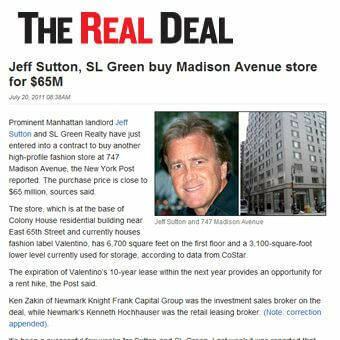 Prominent Manhattan landlord Jeff Sutton and SL Green Realty have just entered into a contract to buy another high-profile fashion store at 747 Madison Avenue, the New York Post reported. The purchase price is close to $65 million, sources said. The store, which is at the base of Colony House residential building near East 65th Street and currently houses fashion label Valentino, has 6,700 square feet on the first floor and a 3,100-square-foot lower level currently used for storage, according to data from CoStar. The expiration of Valentino's 10-year lease within the next year provides an opportunity for a rent hike, the Post said. Ken Zakin of Newmark Knight Frank Capital Group was the investment sales broker on the deal, while Newmark's Kenneth Hochhauser was the retail leasing broker. (Note: correction appended). It's been a successful few weeks for Sutton and SL Green. Last week it was reported that fashion label Dolce & Gabbana had inked an 18,400-square-foot, $300 million lease at their store on Fifth Avenue.